Work on the front of an empty shop in Fleet Street has exposed these ghostly traces. The sign read 'Aerated Bread Co', a company whose name referred to the bread they sold. (It was baked by the aerated, or carbonic acid gas, method.) However, the company is better known for its tea rooms, later the ABC Tearooms. The first one - indeed, the very first tea room - opened in 1864, and these establishments changed many women's lives by giving them a public place where they could respectably meet unchaperoned. The company continued trading until the 1980s; the site of its former bakery in Camden Town is now occupied by a Sainsbury's. Good news for all lovers of London history - June will be dedicated to the city's past, with hundreds of special events. Organisations including English Heritage, Open House and the BFI are involved, alongside the Museum of London, Horniman Museum, London Transport Museum, and hopefully local museums. There will even be a special 'London Poems on the Underground' booklet. A few highlights include a walking weekend on 6-7 June; the 'living weekend' on 20-21 June which will see jousting at Eltham Palace and a Victorian country fair at Kenwood House; a river pageant on 20 June marking 500 years since Henry VIII became king; and the story of London in one day (6 and 7 June). Both the lecture series on 20-21 June and the Lives of Buildings events on 26-28 June look particularly promising. 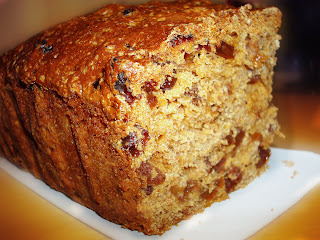 One of Wales's most famous specialities is bara brith, or 'speckled bread'. The speckles are dried fruit; the bread is a sweet tea bread. It supposedly originated when dried fruit was mixed into the last of the bread dough for a treat. There are endless variations on the recipe, with each region having its own. 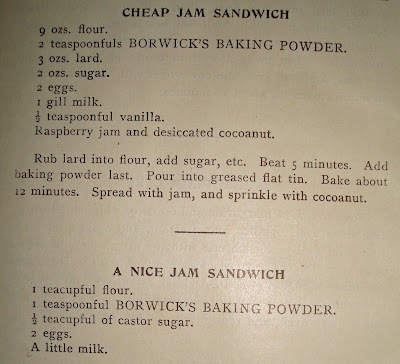 One major difference is the use of either yeast (mainly in the north) or baking powder (in the south). Some versions call for mixed dried fruit, others sultanas, and the spices also vary. My family's recipe contains no butter and has the fruit soaking overnight in black tea, but others disagree. There's even controversy on how to eat it: although tradition apparently dictates otherwise, many people enjoy it spread with butter. The teabread has a South American connection too. Welsh immigrants to Argentina brought the recipe with them, and it is still made there today although it has gained a Spanish name, torta negra. Donald was bathing in the River Lea when his cousin, swimming with him, got into difficulties. Donald drowned trying to rescue him. (It is interesting that here, as in Alice Ayres's case, the family relationship went unmentioned: perhaps the rescue of relatives sounded somehow less heroic). Sixteen-year-old George Blencowe drowned similarly, attempting to rescue a friend. However, other organisations were able to reward happier outcomes. In 1909, 13-year-old Florence Manning was awarded a bronze medal by the Royal Human Society after she saved a friend from drowning. 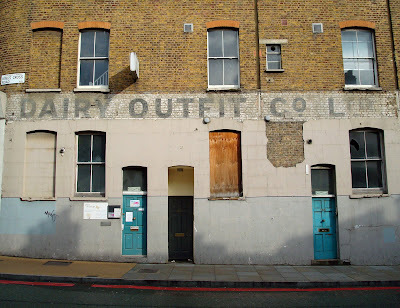 This fading sign on King's Cross Road is a reminder of the days when the area was known for its dairies. The Welsh dairy was a familiar feature of London street corners in the nineteenth century; as the shops later expanded into general groceries, they became the city's corner shops. However, as long as the dairies sold milk, cheese, butter and eggs - often with their own cows in the yard - they would have depended upon companies like this one. The Dairy Outfit Co Ltd could supply 'all appliances for dairy use'. These included display items, from cream pots to milk pails. After all, who could resist the milk kept in one of their white china pails with 'pure milk' inscribed in blue and a metal lid? Behind the scenes, equipment such as a butter churn or cream separator would be essential. Eggs for incubation could be safely transported in egg boxes made of wood and lined with felt. The company could even provide milk pail scales for weighing milk by pounds or pints; and in 1921 they patented a device for cleaning railway milk cans. During the twentieth century the Welsh dairies gradually disappeared, and the Dairy Outfit Co appears to have died with them. 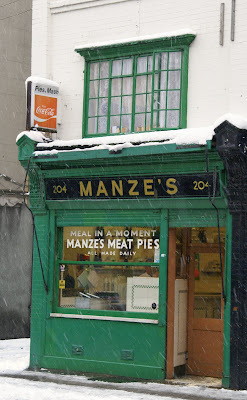 However, its sign remains as a reminder of London shopping past. 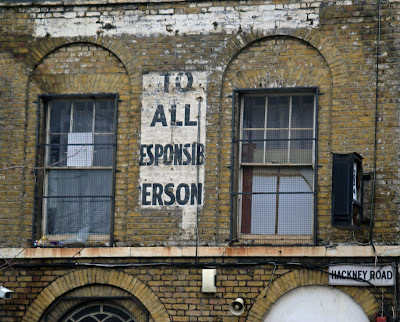 The remaining bits of this ghost sign don't tell us what was being addressed 'to all responsible persons' on Hackney Road, but the side wall perhaps gives us a strong hint. 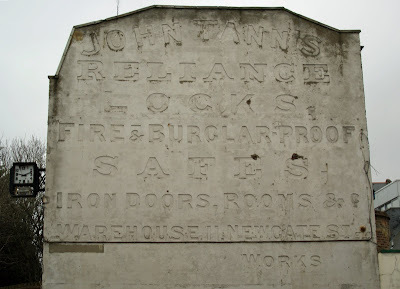 Still embossed in the rendering is an advertisement for John Tann's security equipment including locks, safes, iron doors and strongrooms. The firm was indeed a leading one. Founded in 1795, it supplied safes to organisations including the Bank of England, while its doors protected the Crown Jewels. Having continued until 1990, the firm then merged with Swedish firm Rosengrens, and still trades today as Rosengrens Tann. 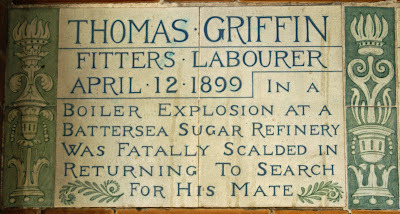 In 1899, 21-year-old labourer Thomas Griffin suffered a fatal accident at the refinery. He was working in the hydraulic room when he heard an explosion. It came from a room where his colleague F Briggs worked, and he rushed into the steam shouting 'my mate, my mate'. When he emerged a few minutes later, he was terribly scalded and soon died from his injuries. Awfully, his death was in vain: Briggs had already escaped unhurt. William Collins was born in 1721, the son of a Chichester hatter and former Mayor. He enjoyed a privileged education at Winchester School and Oxford University, as well as private means and an inheritance of £2,000 from an uncle. Many of his friends were literary, including Dr Johnson. Not needing to earn a living, he decided to become a poet. Unfortunately, Collins's blessings brought their own problems. He was apparently weak-willed and indolent, better at planning than at carrying his plans into effect. A number of projects were proposed or even begun, but left abandoned. This wasted promise was accompanied by a decline into poor physical and mental health, as well as financial problems. At the young age of 38, he died insane in Chichester. His varied legacy is aptly summed up by the memorial in Chichester Cathedral. It alludes to an anecdote from Johnson: that when he visited him during a lucid period, Collins told him that he travelled only with a bible. "I have but one book," says Collins, "but that is the best." The thickening horror, and exalt his woe. Guard the due record of this faithful stone! And rightly deem'd the Book of God the best. Shippams are famous for their jars of paste, and most of us have probably tasted it in a sandwich at some time. However, only those who paid attention to the label will be aware that the firm was founded in Chicheser in the eighteenth century. The Shippams were prominent grocers and later butchers in the town. In 1892, they expanded by building a factory behind the butcher's shop to manufacture canned goods and potted meats. The famous metal-lidded glass jar was launched in 1905. Now sterilised, the products had the long shelf life which remains central to their appeal. A later innovation was television advertising: they were among the first companies to use this new medium, in 1955 (see their 1955 'guide to opera' advert here). This memorial in Chichester Cathedral is a touching contradiction of the idea that in days of high child mortality, people were less affected by the death of young children. Instead, it shows the impact of one child's death upon a whole family. Ernest Augustus Udny was the son of George, 'Some Years one of the Supreme Council at Calcutta', and Temperance Sophia. He was only seven years old when he died in 1808. 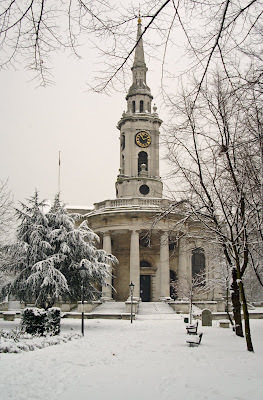 However, perhaps because George and Temperance were in India, the memorial was actually erected by 'his afflicted Grand mother ... as a public Testimony of her Affection for an amiable and most endearing Child'. Sure enough, the memorial is topped with a sickle which has harvested a rosebud. 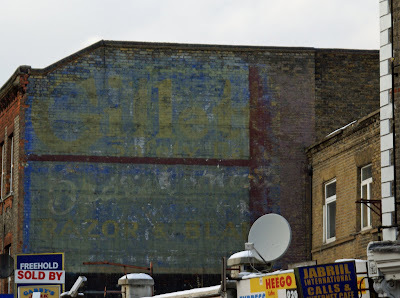 Here are a few ghost signs which I see regularly, because they're alongside the New Cross Road. The first one is practically opposite my street, and is a nice example of an advertisment for Bryant and May matches. It gives a strong 'Buy British' message: these are 'British matches for British homes'. The order at the bottom to 'save the panels' presumably suggests some kind of promotional gift scheme. The second sign also refers to matches - Criterion, this time (see a clearer example on the Ghost Signs blog). The text and an image of the matchbox survive in a greyish colour, the bottom layer of a palimpsest. Overlaid are advertisments for 'Redfern's' (I've no idea what the product was) and for Nestle Milk, 'richest in cream'. Clutten, Swan & Co, Artistic Ticket Writers have painted their publicity over one for sanitary engineers. Palimpsests generally show where a wall was rented for a fixed period, after which a new 'tenant's' advertisement would appear. However, given the trade of the newer advertisers, it's fun to imagine that they were maybe carrying out a 'repossession' for non-payment! Just a quick mention that the London Encyclopaedia is currently on offer at The Book People for £12.99 (usual price £50). It's one of my favourite London books, a comprehensive collecton of information on all aspects of the city's history. 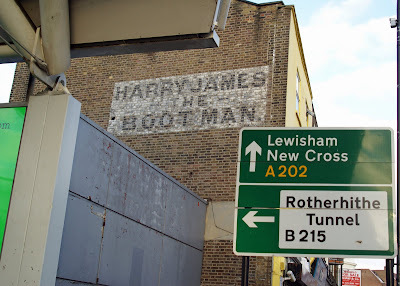 A few Peckham ghost signs (mostly to be seen from the 436 bus route!). First, Harry James the Bootman offers no nonsense. One imagines workboots which would last and last, rather than fashion footwear. 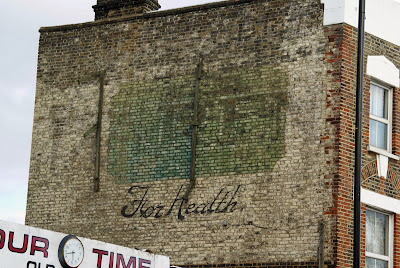 This ghost sign in Queen's Road still has a clear slogan: 'For Health'. However, what should we be buying for our health? That part of the image has faded badly, but it was for a company called Daren who made bread: see this image of their advert for 'the best brown bread'. The parts which have survived also suggest a whole history of previous billboards placed on top. A Gillette advertisement has survived in a colourful form; layers of other painting also show through. Contrast it to the version on Commercial Road, Spitalfields below. Last year, the Grand Pier in Weston-Super-Mare suffered a fire which destroyed its pavilion. Worse damage was prevented by employee Robert Tinker who went into the burning building to remove gas cannisters. The shops at the land end and the walkway reopened, within days and it was announced that the pavilion would be rebuilt. A new design has been chosen, and it is hoped that the Pier will fully reopen in 2010. These photographs show the old pavilion. In fact, this was itself a replacement for an earlier building of 1904 which had been destroyed by fire in 1930. A landing stage added to the end of the peir in 1906, intended for boats from Cardiff arriving at low tide, had been little used and was removed after ten years. The original building's theatre was replaced by a funfair in the second pavilion. It remained as such, with the addition of an amusement arcade, until the fire of 2008. The proposed replacement pavilion will feature rides, an amusement arcade, tearooms and an observation tower. This sign at Wookey Hole warns would-be travellers along the narrow lane to Easton. A charabanc was a motor coach (and before that, a horse-drawn one), used for day trips. They were often open-sided and sometimes open-topped. 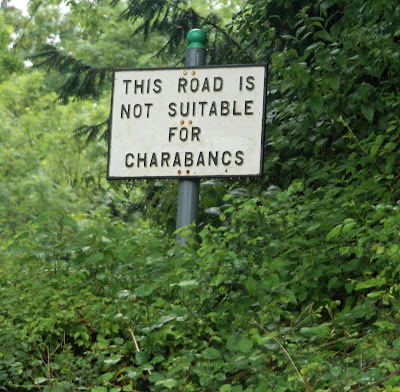 However, they haven't been seen regularly on British roads for some decades, making the sign something of a survivor! Carrington House, a former lodging house in Deptford, tells us a lot about the problems facing social reformers in London. I've already mentioned it as the residence of murderer Albert Stratton. 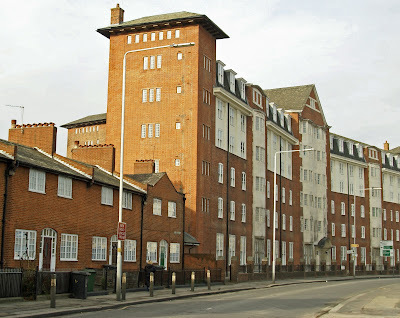 It was built on Mill Lane (Brookmill Road) to replace an area of slums and lodging-houses, notorious for their use by criminals and prostitutes. Other local residents included itinerant labourers and beggars; as well as crime, overcrowding was a real problem. Unfortunately, the development of social housing here was hampered by squabbling between official bodies. The London County Council demolished about 50 houses on Mill Lane at the end of the nineteenth century; eight were lodging houses. The law required half of the former residents to be rehoused. How to do that was the topic of protracted arguments between the LCC and Greenwich Board of Works. The lodging house was a new departure for the LCC, who had borrowed the idea from six 'Rowton Houses' created by philanthropist Lord Rowton to provide cheap accommodation to working men. The LCC building was named after Lord Carrington, chairman of the LCC's Housing of the Working Classes Committee, and officially opened by the Countess Carrington. Each of the 800 men it could accommodate had their own cubicle to sleep in, and there were also common rooms. Photographs in Harvard University Library show a dining room, reading room and smoking room, all large, tiled spaces with parquet flooring and huge windows, furnished with long tables and benches. The 'lavatory' was a room of bare pipework and rows of washbasins. Despite this careful copying of the Rowton Houses, some early residents soon returned to the nearest Rowton House saying it was 'more homely, more comfortable and warmer'. The LCC's version would never be as popular as the originals. A large new establishment for the reception of refugees has just been opened at Carrington House, Deptford, and Miss Ravenor, a sister at Chelsea Infirmary, is acting as Matron. Miss Barton has also supplied nurses. The House can accommodate 800. Nurses engaged in the care of refugees are doing invaluable work at the present time. By the 1920s, the building was once more a lodging house (the LCC's largest). A contributor to Age Exchange's Library of Experience remembers its residents pouring the contents of their pots over the fascist Moseley and his supporters as they marched down the road before the war. In sad contrast, its inhabitants in 1949 included a number of black seamen who faced a racist mob on 18 July. Carrying knives in self-defence, they rather than their 600 attackers were arrested. 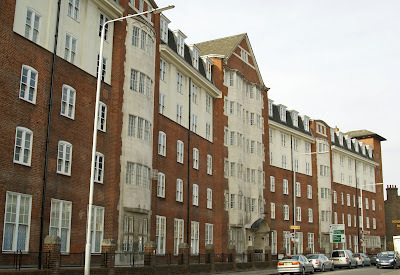 Today, the lodging house has been converted into flats and renamed Mereton Mansions. The Mlle Titiens referred to seems to have been the opera singer Terese Titiens. Born in Hamburg, she had moved to London in 1858 and was considered one of the great sopranos of the nineteenth century. 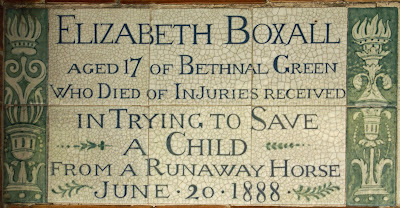 She would continue performing until shortly before her own death in 1877. Like Deptford, Brockley had market gardens, and their most famous produce was giant Victoria rhubarb. Joseph Myatt, owner of Manor Farm, was England's first commercial rhubarb grower. (Another speciality was strawberries, and he held an annual strawberry tea for local people). How did Brockley's rhubarb get so large? The unsavoury secret was 'night soil'. Nothing to do with nocturnal earth, this was a euphemism for human waste. In the days before flush toilets and Bazalgette's sewage system, night soil men were paid by householders to empty their cesspits and then sold the contents to farms around London as fertiliser. Since Victoria rhubarb prefers a rich soil, this form of fertiliser worked well. However, in the mid-nineteenth century, both changes in sewage disposal and the arrival of the railway and residential developments saw the end of large-scale rhubarb cultivation in Brockley. If you fancy recreating this part of South-East London's past, Victoria rhubarb seeds or crowns are readily available. However, you will need to use a more conventional form of manure: use of human waste is now known to pose health risks, as well as offending the neighbours! Walter Peart and Henry Dean were the driver and stoker of the Great Western train known as the Windsor Express. On 18 July 1898, they were driving the 4.15 train from Windsor to Paddington on what seemed a routine trip when, just outside Acton, the connecting rod broke. Part of it was driven through the boiler casing and caused damage to the fire box which overwhelmed the men with cinders, steam and fire. Nonetheless, they succeeded in applying the brake and bringing the train to a safe standstill before leaving the engine at Acton Station. I stopped my engine. ... When it happened, I got back out of the way, and I thought to myself, the train is running as fast as ever. I thought I would go back to the fire and put my vacuum brake on. I did it, and as I got out from the fire and the smoke I couldn't run and when I was by the side of the engine my leg was struck by the connecting rod, which was broken. Among the lives saved by Peart and Dean was that of Mr Goschen, First Lord of the Admiralty, who wrote with a subscription to their families. However, Peart and Dean themselves died of their injuries in St Mary's Hospital. 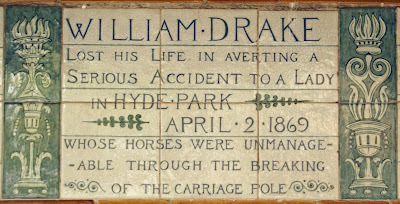 The inquest jury desired 'to place on record their high appreciation of the conduct of the two deceased men in applying the brake and in keeping at their posts, thus averting a very serious catastrophe which would have endangered the lives of the passengers of the train.' Both men left widows, and Peart also had five children. 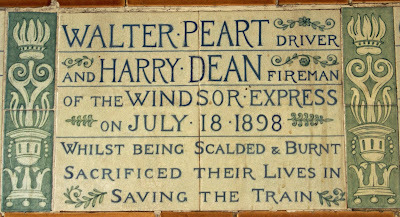 WALTER PEART DRIVER AND HARRY DEAN FIREMAN OF THE WINDSOR EXPRESS ON JULY 18 1898 WHILST BEING SCALDED & BURNT SACRIFICED THEIR LIVES IN SAVING THE TRAIN. Such an act of self-sacrifice by railway employees was not unique. Daniel Pemberton would die at Twickenham in order to save a colleague. They were working on the railway track when an express train approached; Pemberton pushed Thomas Harwood safely out of the way but was himself struck by the engine and killed. DANIEL PEMBERTON AGED 61 FOREMAN LSWR SURPRISED BY A TRAIN WHEN GAUGING THE LINE HURLED HIS MATE OUT OF THE TRACK SAVING HIS LIFE AT THE COST OF HIS OWN, JAN 17 1903. 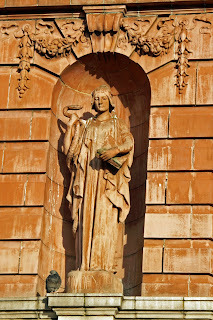 The Prudential Building in Holborn is something of a landmark, and I was fascinated to discover from Ornamental Passions that it features a sculpture of Prudence herself. So when I recently noticed that Lewisham High Street has its very own Prudential Buildings, the obvious question was whether the figure on its corner is Prudence too? Indeed she is (in fact, she's handily standing on a name label) - some twenty years younger than her Holborn counterpart. Unlike big sister, she carries not the mirror of self-knowledge but a snake symbolising wisdom. In the other hand is a large book: presumably an insurance ledger! 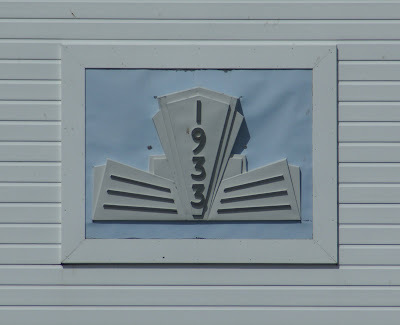 Interestingly, the company's logo has always featured Prudence with a mirror, making Lewisham's version something of a departure from the company norm. By the time Prudential Buildings opened, the Pru was Britain's largest life assurance company, insuring a third of the population. Founded in 1848 in Hatton Gardens, it had begun selling 'penny policies' to the working classes in 1854: agents ('the man from the Pru') would call door-to-door, collecting payments. It was also the first City company to employ female clerks, from 1871. Today, Prudential is a huge international business with a wide range of products including the internet bank egg. Further reading: Prudential Assurance at Ornamental Passions. The History Nugget meme is a place to write about history. 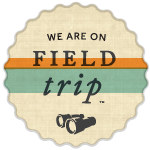 All entries are welcome, whether you write about a photograph you took or want to enter a full-blown article. The only “rule” is that it has to be about the past in some way. Juan Flaco Brown by AmberLee. The First Drawings of the Moon by Kristin. If you fancy joining in, see the full rules here! 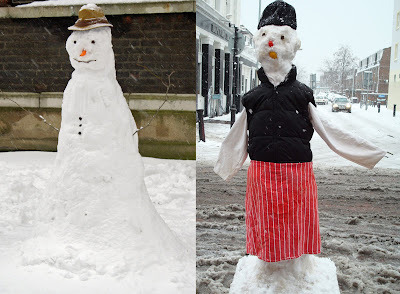 Obviously I'm far too mature and sophisticated to get excited about a few inches of snow. So here are the photos I rushed out to take this morning. In a calm and dispassionate way. Obviously. 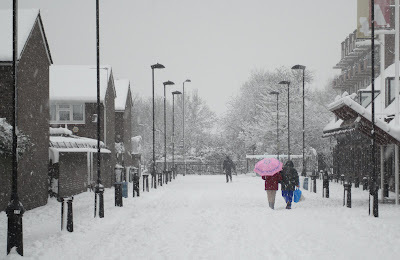 And for more Deptford snow, have a look at Deptford Dame's pic here. 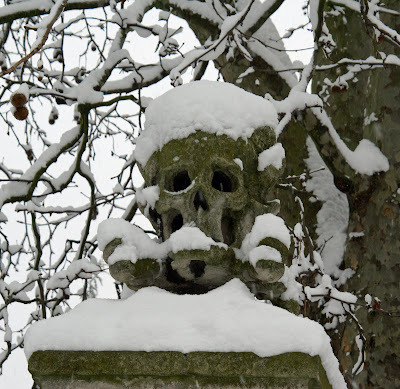 Although every story on the Watts Memorial has its own interest, there are certain causes of death which appear again and again. While they are of course not a representative sample in any way, they do highlight both the dangers and the preoccupations of Victorian and Edwardian London. The person without a strong London connection was Mary Rogers, whose heroism on the steamship Stella made her a national hero. However, the London focus was not accidental as Watts hoped that other towns would erect their own monuments to ordinary heroism. It has been suggested from time to time that the memorial should be revived by the addition of new plaques (I think that that would be a lovely idea). These figures suggest two questions: first, would the London bias remain? Second, what types of heroism would be most prominent today?